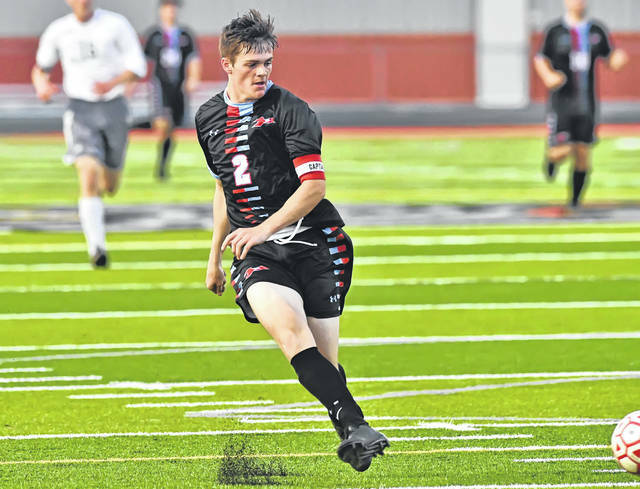 Lima Central Catholic’s Trey Horstman scores a goal during Tuesday night’s match against Temple Christian at Spartan Stadium. See more match photos at LimaScores.com. Temple Christian’s Darrick Clay (12), and Michael Engle defend Lima Central Catholic’s Trey Horstman (2) during Tuesday night’s match at Spartan Stadium. LIMA — Lima Central Catholic wanted to get off to a quick start. The T-Birds did just that. 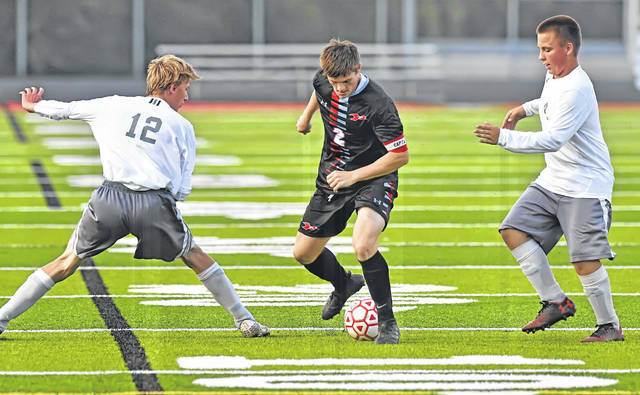 LCC scored two early goals in Tuesday night’s contest against visiting Temple Christian. However, the Pioneers battled back and eventually knotted the score, en route to a 2-2 tie in boys’ soccer action at Spartan Stadium. For the game, LCC (3-3-1, 1-0-1 Western Ohio Soccer League) had eight shots on goal, while Temple Christian (4-2-3, 1-1-2 WOSL) got five clean shots on goal. LCC’s first goal came just a little more than a minute-and-a-half into the contest. After a close-range shot by Trey Horstman that bounced off the goal, teammate Josiah Simpson (three shots) drove the missed shot into the back of the net to give the T-Birds an early 1-0 advantage. Then, less than four minutes later, Horstman scored off a fast break, slipping the ball to the left corner of the net to give the T-Birds a quick 2-0 lead. Temple Christian scored its first goal off a deflection by Daniel Engle at the 27:30 mark of the first half, cutting the deficit to 2-1. The remainder of the first half was a defensive battle as neither team was able to muster a clean shot on goal. In all, both squads took three shots each in the first 40 minutes of action. LCC went into the halftime break with a 2-1 lead. In the early moments of the second half, LCC got two good shots on goal, but was turned away both times by Temple goalkeeper Cody Motter (five saves). Less than 10 minutes into the second half, Temple Christian’s Brody Bowman got a shot to go into the back of the net for a goal. Bowman drove it in from about 10 yards out to knot the game at 2 apiece. “It’s been a problem the last few games, for us to step it up a little harder in the midfield,” McPheron said. “The first two goals, we just gave guys like Simpson too much space in the middle of the field. And when they have time to deliver the ball to their players, it’s hard for us to catch up sometimes in the back. I thought we did a better job of really closing down the midfield (in the second half).